Pete says: "We are the boutique venue." In the past I described the boutique music venue as a small room with 150 or less seats for discerning audiences prepared to pay the price to not be in an impersonal crowd. The dictionary describes boutique as a "specialty shop". Well, the Douglas Beach House is a boutique music venue -- designed to capture the musical spark that connects people to the music. No more jamming people in the room just to be able to pay for the talent. We are not going to book headliners exclusively, but continue to book the best emerging talent as well as proven veterans musicians from the past. But if our audiences want top talent with all the intimacy and comfort possible, then we must pay for it. We will charge anywhere from $35 to $45 and beyond. We will continue two sets of music, not a 1 1/2 hour show. 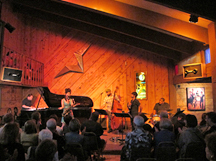 Two sets give the audience and musicians a break to digest more demanding music and gives the audience a chance to talk to each other during intermission -- which they will in a small room. At first musicians, bookers and owners of commercial drinking clubs didn't take these venues seriously because they had a limited number of concerts and not selling booze and food to make a profit. When I and carpenter friend added a music room to the Beach House in 1971, it was not to be a full time drinking club. I was going to rent it for parties and receptions and continue to book live music no more than once a week. I knew I could make little rent from music programs if I wanted to hear top quality talent, not only Jazz but Classical chamber music and traditional World Music. In 1985 the Bach Society presented 70 classical and jazz performances and I received only $5,000 rent for the whole year. Our rustic Beach House has continued to be supported by our members and audiences since we were incorporated as a nonprofit in November of 1964. But will our audience continue to be those discerning people (with some money)? After all, the pop/rock audiences pay over $100 to be in a crowd of thousands just to say they heard the music live. An audience always senses when musicians have found their voice. Have a little patience and you'll be rewarded. Today many people do not recognize musicians whose musicianship is incredible but do not have the notoriety of past innovators--a Dizzy Gillespie, Stan Getz and Lester Young. Perhaps what we have to charge at the door will be an indication of the best touring groups and musicians. I hope the Bach Society and other small venues will always have a discerning audience who actually want to be near great talent and enjoy art as well as entertainment. Will the Bach D&D Society continue after my demise. Only time will tell. Pete Douglas is the Owner of The Douglas Beach House (the venue) and President of the Bach Dancing & Dynamite Society (the presenter). Attorney Brian Jones incorporated the Bach Society as a nonprofit in 1964 and Pat Britt is its Music Founder. © 2019 Bach Dancing & Dynamite Society � The Bach Dancing and Dynamite Society is a 501(c)(3) organization.